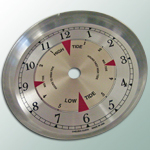 Plastic gauges often fulfill a functional and aesthetic purpose. 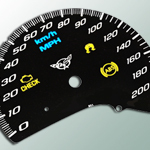 We offer back lighting, dead front and clear windows to make your speedometer or gauge face fully funtional. Chrome inks, patterns and forming can also be incorporated to add to the visual appeal of the product. Carbon fiber and technical looking surfaces are often used to add perceived value. 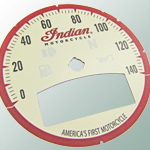 Aluminum dials can take advantage of the substrate by incorporating mechanical finishes such as spin or engine turn into the background. 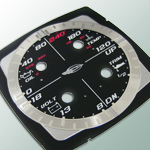 We also integrate aluminum and polycarbonate together into gauges which offer the aesthetics of aluminum with the functionality of plastic.